Pip Wilson bhp: A Blob Tree activity for Group-Work and to do yourself - give it a go please? A Blob Tree activity for Group-Work and to do yourself - give it a go please? My question is relating to the 6 BLOBS above. The one we find the hardest to understand - to LOVE even. Think of a a person who is bruised. Someone who is going through a rough time. it makes more/greater impact on you. the nearest to your FEELINGS RIGHT NOW. 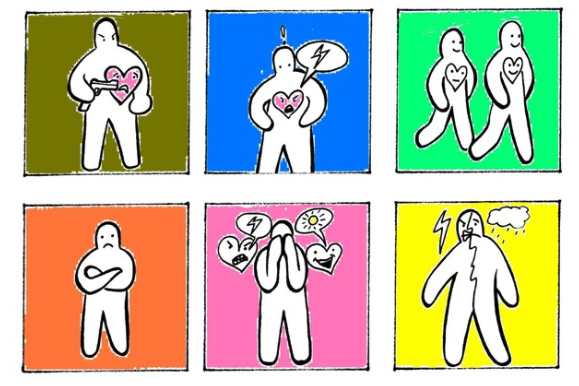 The Blobs help many people to identify their feelings. Even young children who are not emotionally literate. They can point/touch and OWN their feelings. This is ALL GOOD this is for me - and YOU I believe. to be able to empathise with others BHP's. Feelings are signals and nothing to be afraid of. I had a big signal this morning. I need to dig into it. which is nearest this BHP. AND that is great in my book. always made me know I was fat. I could never make him love me. as if I was falling down a dark hole."